In recent years, Marriage had faced countless attacks from many and varied factions of secular societies. For many of our Christian Faithful, marriage seems to be standing before a tsunami. It would be easy and popular to fall into line with secular culture and simplify the Institution of Marriage into oblivion. Canon Law is the front line of defense for the Sacrament of Marriage. 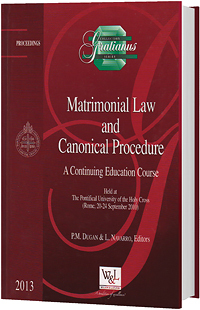 These Proceedings of the Fourth Continuing Education Course on Matrimonial Law and Canonical Procedure, attempt once again to address Marriage Law in our Church and to emphasize some of the Pastoral Essence of Marriage and Family. This Program is a beacon for marriage in the Catholic Church. It recognizes the law, examines it, interprets it, and in the end, it revels in the sacramentality of this great Gift of Faith. Expert Canon Lawyers address all of the fifteen presentations at these Proceedings. Among them: the Prefect of the Apostolic Signatura, Cardinal R.L. Burke, the Dean of the Roman Rota, Bishop A. Stankiewicz, members of various Church Tribunals, Reverend Nikolaus Schoch (The Supreme Tribunal of the Apostolic Signatura), Monsignor Paolo Bianchi (Ecclesiastical Tribunal of Lombardia, Italy), Monsignor Giueseppi Sciacca (Prelate Auditor of the Roman Rota), Monsignor Carlos Manuel Moran Bustos (The Rota of the Apostolic Nunciature, Spain), Rev. William Elder, (Archdiocese of New York, NY), and Reverend Jorge Garcia-Montagud (Archdiocese of Valencia, Spain), and Academic Professors, Monsignor Professor Carlos Jose Errazuriz, Monsignor Professor Joaquin Llobell, Reverend Professor Massimo del Pozzo, Reverend Professor Hector Franchesci and Reverend Professor Miguel A. Ortiz (All of the Pontifical University of the Holy Cross, Rome, Italy), Reverend Professor Pedrom Juan Viladrich (University of Navarre, Spain), and Professor Carlo Gullo (Advocate of the Roman Rota).